In Brief: James Barclay’s Dawnthief features a band of mercenaries in sword-and-sorcery style adventure. The characters are hard men (and women), loyal to each other first, who find themselves drawn into a great conflict with darker forces in the land. Pros: Barclay has a good command of military history, and his system of magic is consistent. A good sense of history, solid characters, and an eye for avoiding cliches make this a an effective first effort. Cons: The beginning chapters are messy – perhaps due to a switching p.o.v. style that is somewhat troublesome. The logic behind the penultimate spell at the heart of the story is a little sketchy. Review: Dawnthief introduces a band of mercenary soldiers known as the Raven. A small but intensely loyal group who earns their money fighting the small wars between the nobles of Balaia. Their code is simple: they don’t do assassinations and they always put the members of the Raven first. In Brief: Paul S. Kemp’s The Hammer and the Blade is old-school Sword and Sorcery with contemporary sensibilities. Kemp pays homage to Leiber and Gygax, and sets up a pair of of likable characters for serial-style adventures. Pros: The lead characters, Egil and Nix, are familiar tomb-raiding adventurers straight out of the AD&D Player’s Handbook. They are also fleshed out pretty well as the author introduces his magical world and keeps the plot moving. Kemp obviously knows his Sword and Sorcery, and you feel as if you might bump into The Gray Mouser or Conan or Kull at any moment. Cons: The Hammer and the Blade is a self-contained adventure focused squarely on Egil and Nix. It’s not an epic continent and kingdom spanning tale. Some may prefer a grander scope. The setting and styling are also very familiar fantasy staples, a potential drawback for those seeking less familiar worlds. Review: The book opens with Egil and Nix in the final stages of a dungeon crawl. They are professional tomb raiders who’ve been at it for awhile, as quickly established by the author’s rapid quip-filled dialogue. This is Riggs and Murtagh with swords and warhammers. In the tomb of an ancient wizard king, they avoid traps and finally face off with a hellspawn guardian. In Brief: In this second book in Joe Abercrombie’s First Law trilogy, established characters pick up the pace with war brewing on two fronts and a quest for a lost artifact. Pros: The excellent writing and Sword and Sorcery feel continue from the first book. The author sticks with the same core characters and continues to develop them. The action is quick and deadly, the pacing and plotting are spot on. And you have to appreciate the gallows humor. No second book lull here. Cons: Some readers seeking a deviation from the classic neo-European fantasy setting may be disappointed. Review: The title of Before They Are Hanged, courtesy of an epigraph from the poet, Heinrich Heine: “We should forgive our enemies, but not before they are hanged.” Yeah. That sums up the prevailing ethos of the main characters as well as the author’s thematic approach. It’s a welcome approach, true Sword and Sorcery in the tradition of Robert E. Howard and Fritz Leiber rather than Tolkien (although the nods to Tolkien are evident). Abercrombie continues with the main characters from The Blade Itself: Logen Ninefingers, practical barbarian from the north, Superior Glotka, the crippled inquisitor who was once a soldier and court favorite, Bayaz, first of the magi, Ferro, former slave and assassin, Captain Luthar Jezal, fencing champion and upper-class twit, Colonel West, self-made officer from the provinces, and the Dogman, renegade Northman tracker and archer. In Brief: Joe Abercrombie introduces a cast of realistic characters with a harsh and sometimes humorous Sword and Sorcery bent. There are quests and vendettas and backroom deals. The plot and world will no doubt seem familiar; the execution of the story, however, places this book above that fantasy norm. Pros: The characters are flawed, human, and extremely well-conceived. You may not always like their actions or motives, but you damn sure know where they’re coming from. The author hits enough plot marks to keep it moving, introducing his world, history, and system of magic. Very well-written in a gritty realistic fashion. Cons: The late Medieval European-style setting is awfully familiar, which may be off-putting to some. If you like your prose flowery and full of high Fantasy virtue, you may want to look elsewhere. 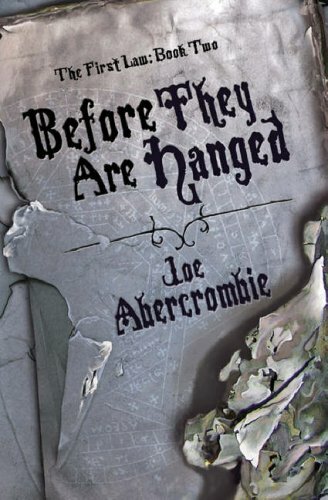 Abercrombie plays in the mud (full disclosure – not a con for me). 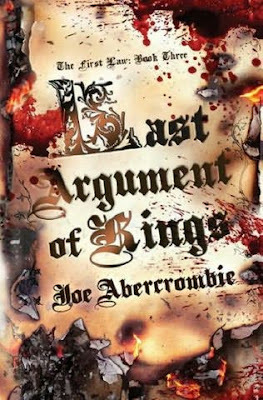 Review: Author Joe Abercrombie has been so lauded and praised since he hit the scene a few years back, I think I subconsciously resisted reading his books. No good reason – other than having been less than impress before with writers getting that kind of pub. But I continued to read and hear about his Sword and Sorcery roots, his two-fisted action pieces, and the interesting, realistic characters he’s created. The final straw was listening to an SF Signal podcast on Sword and Sorcery, in which pretty much all the other writers and editors on the panel recommend the First Law trilogy and Abercrombie’s newest book. So I picked up The Blade Itself, and I’m very glad I did. One book in, and I can already tell it’s likely to be one of my favorite series in years. I will probably end up recommending it highly to my friends who read fantasy and science fiction on a consistent, borderline annoying basis. And here’s why: Characters. In Brief: Conan – Cimmeria is the 7th compilation of Dark Horse’s excellent Conan series, which brings the barbarian back to the land of his origin after years abroad adventuring, plundering, and reaving. Written by Timothy Truman, art by Tomas Giorello and Richard Corben, colors by Joes Villarrubia. Pros: This is the real Conan – Robert E. Howard’s Conan. Expertly characterized by Truman, with beautiful, savage artwork. The story has a mythic yet grounded quality. Cons: The cartoonish artwork of Conan’s grandfather’s interwoven story could have been better. Reading this just makes you wonder why Hollywood didn’t contact Truman and series originator Kurt Busiek to write the recent movie. Full Review: The prologue begins with a view of an old typewriter, Weird Tales magazines on the desk and boxing gloves hanging from the wall. It’s Howard’s room, of course. Flowing into his haunting poem, Cimmeria, which he penned in the Texas hill country back in 1932 when the idea of Conan was being conceived, we see the view of those hills and a transition to Conan returning to his bleak homeland. A bloody encounter with a band of Vanir raiders; we know we’re in good hands with this book. …written by Thomas Donnelly, Joshua Oppenheimer, and Sean Hood; directed by Marcus Nispel; starring Jason Momoa, Stephen Lang, Rachel Nichols, and Rose McGowan. Pros: In the title role, Momoa has some convincing movements, and Lang makes for an excellent arch-villain. The set designers and artists have created a convincing Hyboria, and the action is full throttle. Cons: The tired old revenge-cliche forms the spine of the plot, which is an opportunity lost, considering the breadth of Robert E. Howard’s source material. Review: The latest offering of Conan the Barbarian starts well enough, with none other than Morgan Freeman providing the voice-over narration – the classic introduction to Conan of Cimmeria as penned by Robert E. Howard in the very first short story so many years ago. But then, about a paragraph in, the narration breaks from Howard’s prose and drifts into the tale of an ancient magical artifact, the Mask of Acheron, that was eventually sundered in scattered by tribes of men to prevent its evil use. Standard fare. And I’m sitting there in the theater thinking, Why? Why go this route? Just stay true to the source material! Other fans of Robert E. Howard likely had similar reactions, and this is pretty much the theme of my review for this movie. Why take this iconic character down the familiar, well-worn path? Don’t want to lay blame on the writers (who nonetheless missed some hanging curve-balls with this script), but rather look at the producers, who most certainly squashed anything creative ideas they perceived as outside the realm of the standard Hollywood take on action/fantasy. This is truly a shame, because the cast seemed capable of more, the set-designs – echoing Frank Frazetta and the old Marvel magazines – are evocative, and the action/stunt/fighting team is first-rate. Much like the recent Wolverine film, I found myself lamenting a colossal missed opportunity for something more memorable and unique. Dark Horse Comics got it right with their re-telling of some of those classic Howard stories. They stayed close to the source material, their writers steeping themselves in the original prose. The screenwriters and producers of this movie should have followed suit.